Here’s how to save ourselves from the “voluntary disrupters” blocking our sidewalks. Editors Note: This is a satire inspired by Jonathan Swift (1667-1745). It is truly pilau that when this great island’s visitors and kama’aina want to shop on Kalakaua Avenue or rent a biki on King Street, they have to move aside to avoid the homeless sleeping on the sidewalk. It breaks my heart to think of an auntie who, hobbling from her neighborhood Longs to her Lexus under a solar carport, must acknowledge that there are people who choose to live on the pavement and lack the respect to sleep somewhere else. I’m sure all of you, and our thriving travel industry, would agree with me when I say that these criminals are a blight to our city and a danger to our kupuna! The scene across the street from the mayor’s press conference. 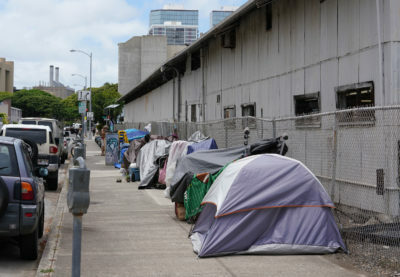 Therefore, I call upon our great City, the Honolulu Police Department, and our Councilmen, to support me in a bill that expands the sit-lie ban to the entire island of ‘Oahu. As your mayor, I have heard your concerns about how this ban will clog our courts and choke our jails. But today, I tell you there are additional measures that may prevent voluntary disruptors from abusing our system. My administration has proven its ability to respond to the many concerns of our residents, and we plan to bring real solutions to not just this problem, but to the greater needs of our state. Now we all know that the sit-lie ban is also about keeping sidewalks open for people to do business, which is why I’m offering a public-private partnership incentive for the hardest-hit areas such as Kaka’ako and Chinatown. For every perpetrator a business owner documents sleeping against his or her storefront, the City will offer that business a $500 check with proof of permanent removal. How the business owner chooses to remove the loiterer is up to them; I’m not going to play luna here. Secondly, we will round up all the drunks and drug users wasting our first-responders’ time and send them to the H-POWER plant in Campbell Industrial Park. Through the natural gas released by this regular supply of alcohol and methamphetamine users, we can increase electricity production for ‘Oahu households by 50 percent. Now some critics may point out this isn’t 100 percent renewable energy, but this renewable source of waste does produce a lot of energy and it doesn’t seem to be going away anytime soon. Finally, for the countless juvenile delinquents roaming our streets, they will be better served in a more structured environment. In partnership with the Hawaii Lodging and Tourism Association, I will personally support the Institute for Human Services with a $500,000 tax-deductible donation to provide homeless ages 5 to 17 a one-way ticket to Chile! These at-risk youths will experience an internship of a lifetime at a Chilean lithium “startup,” a new exchange program co-sponsored by Elon Musk. We supply the labor, he supplies the Teslas! I assure you with all sincerity that I have not the least personal interest in promoting this necessary work, having no other motive than the public good of my City, by advancing our trade, providing for our keiki, relieving our courts, and giving some pleasure to the establishment. 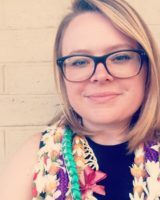 Emily A. Benton is a writer, editor, and co-organizer for MIA Honolulu, a monthly literary arts series that hosts free readings every Third Thursday in Chinatown.